Removing Bulk – The Difference Between Notches and Clips! Home/Sewing Machines/Removing Bulk – The Difference Between Notches and Clips! Curved seams can be a bit challenging to sew on sewing machines, especially when it comes to getting them to lay flat without bunching. Curved seams bunch up because the curve brings the fabric closer together, causing the seam allowance to overlap itself and create extra bulk. 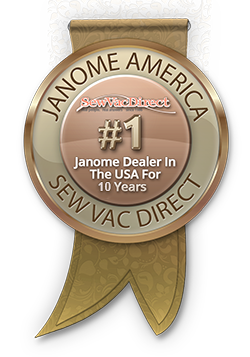 If you want to flatten out the extra fabric bulk and make a smooth, flat curved seam using Janome sewing machines like the Janome 2206, all you need to do is put a few notches or clips in the right places. Notches are little triangles of fabric that get cut from the rounded edge of a convexly curved seam sewn withsewing machines. By cutting out V-shaped pieces of an outwardly curved seam allowance, you can then fold the allowance over without the extra fabric bunching or layering which would affect the look of the seam. Without the notches, you would end up with excess fabric bulk lying on the inside surface of your seam, looking bulky from the front. Notching should be done whenever your pattern calls for a curved seam to make a convex curve such as when sewing sleeve caps, a dipped hem, or a rounded princess bustlines. Notching is done by first sewing in a line of staystitching with your Janome 2206, then cutting out small V-shapes every ½-inch or so along the curve of the fabric. Cut up to, but not into, the stitch line and for an even flatter look, grade the remaining fabric layers that remain in the seam. Then the notched seam can be pressed flat against the wrong side of the fabric. If you want to hold the notches more securely in place, just add a line of topstitching close to the edge of the seam. Clips are small cuts made into the rounded edge of a concavely curved seam sewn with Janome sewing machines. They work similarly to notches to reduce fabric bulk but in the opposite way. Clips cut into an inwardly curved seam line reduce excess fabric bulk by creating separate fabric tabs that can slide over each other and lay flat. As with notching, clipping is appropriate for eliminating the bunching of concavely curved seams so you get a smooth seam. Clipping is generally done for armholes and necklines, allowing you to fold the allowance over and press it flat without having any extra bulk. Clipping is done in a very similar way to notching, beginning with the same line of staystitching and then making clips up to but not into the stitch line. -inch or so along the curve, then grade the layers if desired to reduce bulk even more. Fold the allowance over and let the tabs lay over each other, then press them down. As above, you can also secure them with a line of topstitching close to the edge of the curved edge. See How Simple Notches And Clips Are! Using notching and clipping, you can make clean curved seam lines with sewing machines like the Janome 2206without any bunched fabric. These simple techniques are just two examples of the fine details that can help make the items you sew with Janome sewing machines look just as professional as anything made in a factory!